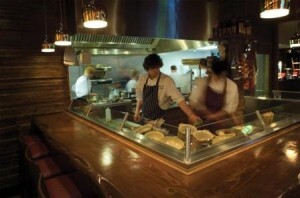 This natural edge, handcrafted, cedar bartops surrounds a food preparation area in Hickory smoke house dinner in Chester. It gives prospective customers an idea of just how durable our solid wood bar tops are, not only do they make a stunning, unique addition to any area but are also hard wearing and durable and become a stunning focal point people regularly asked if it is possible to import timber for bar tops from the states, and further afield and the answer is yes, but WHY, when we have such beautiful native timber. We can supply bartops in solid sections from many English species up to 65mm thick. 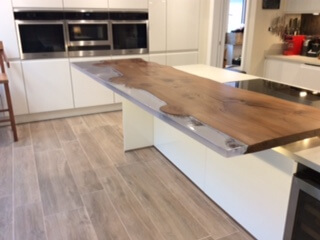 We have just been contacted by a tapas bar in Westminster, London to supply a natural cedar counter top finished in bar top lacquer giving it a lovely honey coloured finish, which Will be installed into their restaurant. we will be able to help you to achieve the desired finish you are looking for to finish your project.